Oorthuis, R.; Hurlimann, M.; Fraccica, A.º; Lloret, A.; Moya, J.; Puig-Polo, C.; Vaunat, J.
Slope mass-wasting like shallow slides are mostly triggered by climate effects, such as rainfall, and soil–vegetation–atmosphere (SVA) interactions play a key role. SVA interactions are studied by a full-scale embankment with different orientations (North and South) and vegetation covers (bare and vegetated) in the framework of the prediction of climate change effects on slope stability in the Pyrenees. A clayey sand from the Llobregat river delta was used for the construction of the embankment and laboratory tests showed the importance of suction on the strength and hydraulic conductivity. Sixty sensors, which are mostly installed at the upper soil layer of the embankment, registered 122 variables at four vertical profiles and the meteorological station with a 5 min scan rate. Regarding temperature, daily temperature fluctuation at the shallow soil layer disappeared at a depth of about 0.5 m. There was great influence of orientation with much higher values at the South-facing slope (up to 55 °C at -1 cm depth) due to solar radiation. Regarding rainfall infiltration, only long duration rainfalls produced an important increase of soil moisture and pore water pressure, while short duration rainfalls did not trigger significant variations. However, these changes mostly affected the surface soil layer and decreased with depth. Oorthuis, R., Hurlimann, M., Fraccica, A.º, Lloret, A., Moya, J., Puig-Polo, C., Vaunat, J. 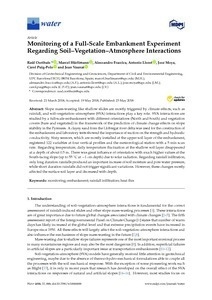 Monitoring of a full-scale embankment experiment regarding soil–vegetation–atmosphere interactions. "Water", Juny 2018, vol. 10, núm. 6, p. 1-23.